I wish I could tell you a colorful tale about how I first discovered migas, but I'd have to make something up! Unfortunately, I've never been to Austin, Texas, where migas is a beloved and ubiquitous breakfast item, and I haven't seen it cooked by anyone but me. I don't remember how I first heard of it, but I've had it in the back of my mind to try for years. Now that I have, I can tell you it's a simple and delectable egg dish and I thought you might like to try it too (if you haven't already). 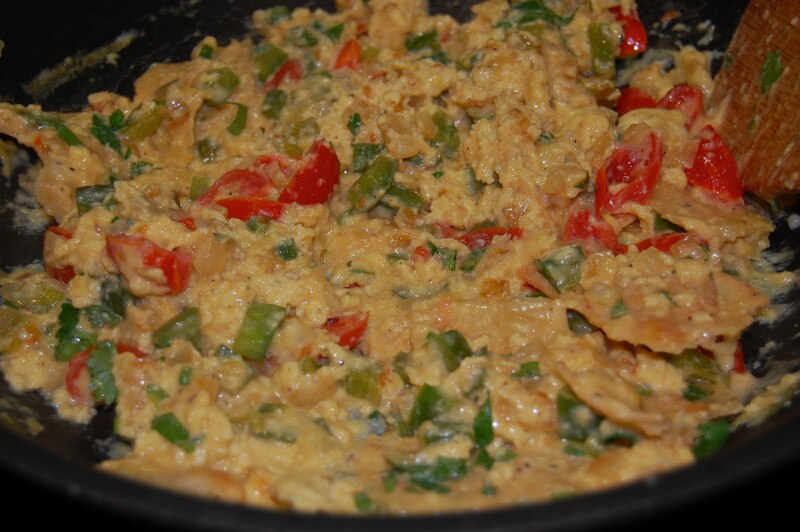 Migas starts out as pretty ordinary scrambled eggs with onions, peppers, tomatoes, and cheese, but the addition of fresh corn tortillas and cilantro sets it apart. The crisped tortillas become softened as they meld to the eggs and lend an irresistible toasted corn flavor. Fresh chopped cilantro, one of my favorite herbs, ties everything together. Presumably, migas was devised as a thrifty way to use up stale tortillas, and I, for one, am pleased to have a use for them. Who knows; you may find yourself buying fresh ones specifically for this dish. Although the tortillas are usually cut into strips and fried in oil, I chose to toast them whole in the oven and tear them into rough pieces before adding them to the eggs. The quantities below are obviously easily adapted to individual tastes. I like a lot of "stuff" in my eggs, and I wasn't shy with the tortillas either. 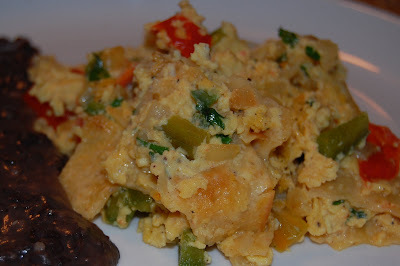 Migas is typically served with refried beans. Brush tortillas evenly with oil on both sides; place on sheet pan. 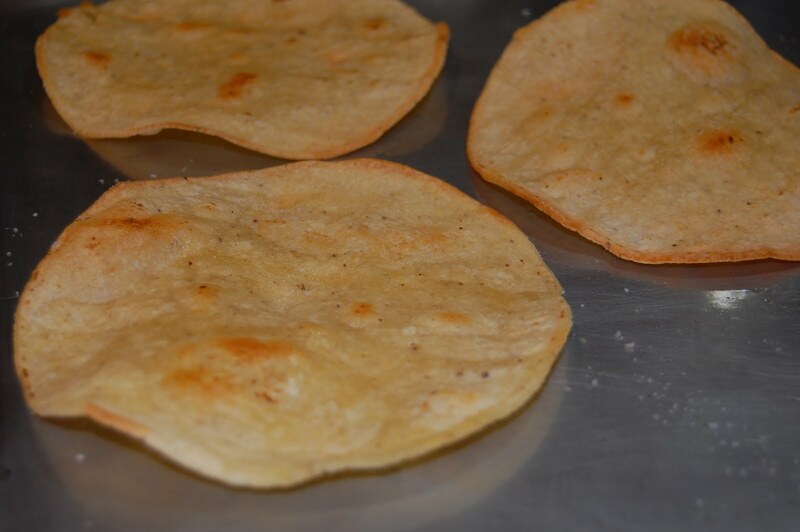 Bake until tortillas are lightly toasted but still pliable, about 7 minutes, flipping them over about halfway through. Remove from oven and salt lightly. Set aside. Beat eggs, 1/8 teaspoon salt and pepper until well combined. Set aside. Tear tortillas into bite sized pieces. Set aside. Heat 1 tablespoon oil in nonstick skillet over medium high heat. Add onions and saute until beginning to soften. 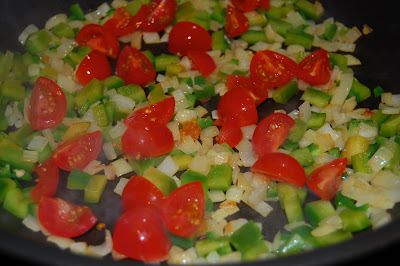 Add bell pepper and jalapenos and cook a few minutes more, until onions and peppers are mostly cooked. Add tomatoes and season the vegetables with a large pinch of salt. When tomatoes are warmed through and beginning to soften, add eggs and tortillas. Reduce heat to medium. Stir and fold eggs gently with a spatula while they cook; do not brown eggs or try to rush them. When the eggs are almost done to your liking, add the cheese and the cilantro. Continue to stir and fold gently until the eggs are done. Check seasoning and serve.